Raised and educated in Maine, Farrington arrived in Hawai`i in 1894 as editor of the Pacific Commercial Advertiser. A few years later, he was managing editor and part-owner of the Honolulu Evening Bulletin, eventually becoming business manager of the combined Honolulu Evening Bulletin and Hawaiian Star (the newspaper that continues today as the Honolulu Star-Bulletin). In the 1910s and '20s, Farrington was also very active in education. As chairman of the Territorial School Fund Commission, he helped pass legislation that established the College of Hawai`i (now the University of Hawai`i), and he then served as chairman of the college's Board of Regents. After his death, Farrington High School was named after him to honor his education efforts. 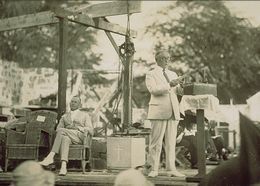 President Harding appointed Farrington governor in 1921. He was reappointed in 1925 by President Coolidge. During his term, he started programs under the Hawaiian Rehabilitation Act of 1921 that had created the Hawaiian Homes Commission.